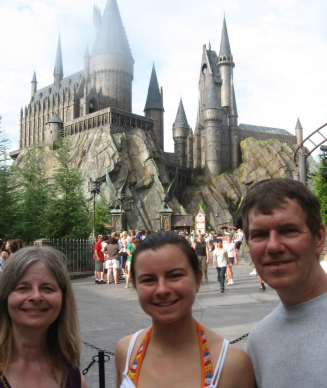 In July 2010 Harry Potter Fan Zone reporters David and Toni Gras had the privilege of visiting the brand new “Wizarding World of Harry Potter” theme park inside Universal Studios’ Islands of Adventure in Orlando, Florida. To start, placing this new “world” in Islands of Adventure was an appropriate move by the Universal planners. The Wizarding World is an adventure in and of itself, but to get to Universal Studios’ representation of Hogsmeade and beyond, one must first pass through some other pretty amazing adventures such as Dr. Seuss Land and The Lost Continent – where scenes of Morocco and Sinbad the Sailor greet you. Near the entrance to the Wizarding World stands a griffin holding a torch – an appropriate welcome to the general area. Upon approaching the entrance arch to the Wizarding World, a sign states “Please respect the spell limits”. At this time, one knows you are entering into a very different world! Wands at the ready! Our first reaction upon seeing the scenes at the WWoHP Hogsmeade were “WOW – WE ARE IN THE POTTER MOVIES”! The depiction of what Hogsmeade looks like is true to what Warner Bros. has depicted in their movies – so true and life-like that the snow lining the edges of the buildings almost looks real (and in the heat of a July day in Orlando – we WISH it were real!) .As a suggestion to Universal for future enhancements – have some “cool zones” directly under the snow! We (well – okay – really, I!) bounced around gleefully saying “oh my – oh my – how REAL this all looks!”. We all admitted, as did everyone we spoke to at Infinitus, that Universal certainly created the right atmosphere! Looking to the right of the entrance at Hogsmeade (easy to miss if your eyes are firmly fixed on the rest of Hogsmeade in front of you) was a replica of the Olton Hall 5972 train engine – aka, the Hogwarts Express – not running, but lots of steam coming from its front – trolleys with luggage and owl cages were off to the side. A prime photo-taking area! As we meandered around Hogsmeade, we saw familiar shops – Olivanders, the Owl Post, Dervish and Banges, the Hogshead pub, and of course, Honeydukes. A note here – real Potter fans KNOW that Olivanders is NOT in Hogsmeade but J.K. Rowling herself approved this move – just go with it! But looking beyond the snow-covered rooftops of Hogsmeade, we saw the real focal point of the WWoHP – none other than Hogwarts Castle itself, looming majestically towards the back of Hogsmeade. And you can actually go inside it! This is truly unprecedented as most Potter fans know that Hogwarts Castle in the movies is largely constructed from bits and pieces from different filming locations around the UK (hint: see Beyond Boundaries’ HP Fan Trips for some pretty interesting tours to these filming sites!). This was actually our first real destination beyond the original gasp of wonder at Hogsmeade. We just had to ride “The Forbidden Journey” which is in the midst of Hogwarts Castle before the crowds came! We breezed through at 7:45 AM as guests of the Universal Hotels receive early admission – and we gleefully walked through the fascinating twists and turns of the interior of the castle feeling as if we were inside Hogwarts! The Mirror of Erised is one of the first things to greet you – and then majestic sculptures of Salazar Slytherin and Fawkes the Phoenix. The Sorting Hat sits on its small throne and chats as you saunter by. But the paintings are not so easy to walk right by– so many of them to view – and listen to – and watch! Don’t be afraid to bend that neck backwards to see all of them, up the invisible staircases (we found out later that if you are lucky enough to get Express Pass entrance you will actually get to walk up a staircase!). You will have the sensation that you are floating in mid-air – not exactly a ride for a full or queasy stomach! But so well worth it! Oh– watch out for the spitting dragon! All too soon the ride is over and you are being applauded by the students and staff of Hogwarts! Don’t forget to check out the photo at the end in the gift shop! Attached waist packs ARE allowed on the ride – just not anything loose – lockers are right in the castle. We rode this ride three times and each walk-through found something new to be amazed at – a definite “must do” while in WWoHP! Oh – for the queasy stomachs out there – you can choose to just walk through and not ride – look for that line or ask the attendant. And yes, yes, yes, take your camera (as long as you can put it in a pocket while boarding the ride). Another “don’t miss” is Olivanders Wand Shop – a long wait by this time – but grab a Pumpkin Juice or Butterbeer from the cart across the street and you will be held over for a while. And don’t neglect the photo ops in this line – the picture of the three of us with Hogwarts Castle in the background (above) was taken while in this line – one of just a couple of pretty unobstructed views of the castle (the other is walking from the other direction from Jurassic Park, over the bridge). Don’t forget to window shop while in this line – especially for the exhibit on Gilderoy Lockhart! Once inside Olivanders, get ready for some magical moments! A child is usually chosen for the demonstration – step to the back wall and take photos and/or movies – linger towards the end of the line and meet and greet Mr. Olivander himself while getting a photo by the stack of wands! Head to the Dragon Challenge ride before eating anything. The walk-way to this ride is themed after the Triwizard Tournament in Goblet of Fire – don’t miss the props along the path – the Ford Anglia from Chamber of Secrets is a great photo op! Chose your side to ride on – Hungarian Horntail or Chinese Fireball – and hold on! This is a ride for those who love thrill amusement park rides that go upside down! The Hippogriff is a mild child-sized coaster – but Hagrid’s Hut makes it worthwhile for all to ride! The stomach is empty so it is time for some food – where to go but The Three Broomsticks! Go at off-times and you don’t wait too long. We tried the typical English fare – Shepherd’s Pie and Pixie Tarts were delicious and not all that pricey. If you want Butterbeer you can get it here or in the adjoining Hogshead pub (very authentic – look for the actual hogs head above the bar!) which also sells Hogshead brew (a delicious full-bodied ale). Sit and talk but don’t forget to watch the walls – night-time is especially good for this as you just may be lucky enough to spot Dobby in the shadows! For dessert, head over to Honeydukes and pick up a chocolate cauldron from the bakery – perhaps with some treacle fudge – and of course, a chocolate frog (don’t miss the ones in the window!). Browse in Zonko’s Joke Shop while there – grab some Pepper Imps (if you dare!) and of course some Bertie Bott’s from the bulk candy section! Do some window shopping now to let the food settle – don’t miss the screaming mandrakes or the ball gowns and tuxedos – even the restrooms are themed appropriately! Or grab an extra Hogshead brew from the bar and sit outside on the patio overlooking the moat and castle – what a view! And whatever you do – go back at night to view it – a totally different atmosphere – all the witches and wizards are allowed to come in costume after a certain time in the afternoon so this is prime time for photo ops! Tip – it is worth it to stay even just one night at a Universal Resort just to get into the park earlier . You can also use your room key as an Express Pass to other rides in the park (which we did use and cut out time spent waiting in other lines to minutes versus hours!). The day you arrive counts as your first day so you can purchase a two-day park pass (cheaper at the hotel concierge desk) and go the first day (as early as you arrive – leave your bags with the porter) and repeat for the next day! And you get to use the cute boats that take you from the hotel to City Walk (which is by the entrance to both Universal parks). The Wizarding World of Harry Potter will transport you into another world – a world of magic, spells and fantasy! Isn’t it worth it to leave the “real” world behind and become part of those books and movies that have enveloped your lives for so many years?